In 2015, AKS Cutting Systems and MC Machinery partnered with AKS as the Exclusive and Official Licensee of the MC Machinery X Series Waterjet to manufacture, market and distribute the product. These X Series systems utilize the strength and durability of the MC Machienry design, including the MITSUBISHI CNC control, and offer customers a world-class waterjet design, taper control technology, ultra-high 90,000 psi pressure capability, and made in the USA. 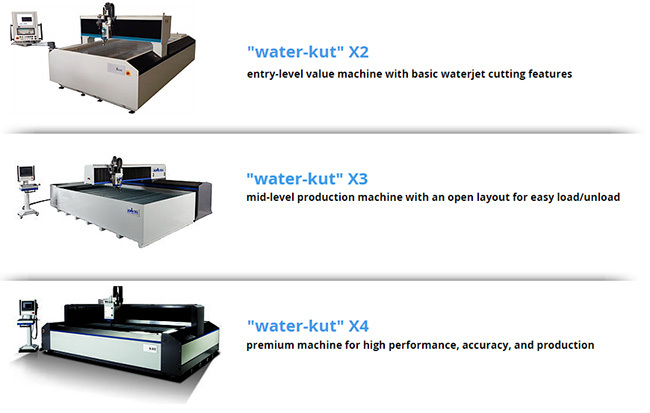 For the most versatile, value added metal cutting systems, offers the water-kut X waterjet systems, which are offered with many options from the entry level water-kut X2, to the mid level machine, water-kut X3 and the premium waterjet cutting system, the water-kut X4. 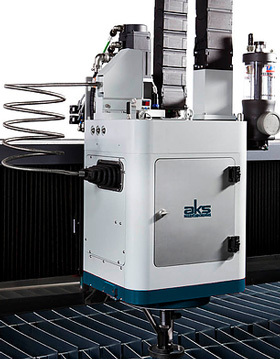 AKS Cutting Systems offers the TCS - Taper Control System which allows the user to achieve the highest accuracy parts by angling the inherent waterjet taper away from the part edge. The TCS uses two additional axes of motion - angular and rotational - to maximize part edge quality and straightness. The result is a final part that is produced faster and with straighter walls, regardless of the thickness or composition of the material being cut. Designed and built in the USA.